Proposition 8 Protesters in St. Louis, originally uploaded by chrisfreeland2002. 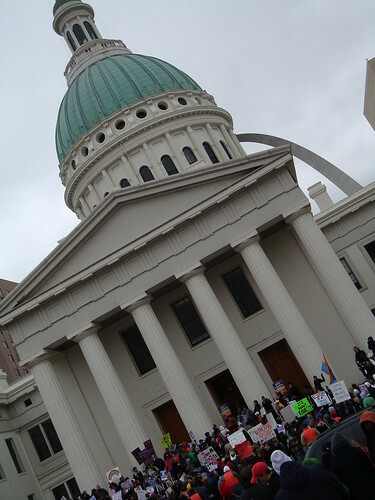 Today on the steps of the Old Courthouse, inside of which the historic Dred Scott case was heard in 1857, more than 1,000 people gathered in a nation-wide protest against California's Proposition 8. Speakers included local community organizers, leaders, and politicians: St. Louis Mayor Francis Slay spoke about equal rights for his 3 gay siblings, and Lewis Reed, the first African American President of the St. Louis Board of Aldermen, described marriage equality as a personal issue for him, noting that not too long ago he would not have been able to marry his wife, who is white. Lead locally by organizer Ed Reggi, the event was part of a national grass-roots movement organized through social networking sites like Facebook and Twitter. The event was great on many levels, but more than anything I think it demonstrated the power of using social technologies to quickly and efficiently organize a "grassweb" effort - this was all planned and executed at a national scale, with participation from all 50 states, in less than a week!